The $21 million Campbelltown Centre of Sport and Health Excellence is set to also deliver a boost to the local economy. Expressions of Interest have been received and elements of the final design are now being completed with plans to award the tender and start construction early this year on the site inside the Campbelltown campus of Western Sydney University. It is expected the centre will be ready to operate some time in 2020. The project is jointly funded, with the Federal Government chipping in $7.2 million, the NSW Government $1.58 million, and Western Sydney University $1.4 million. However Campbelltown City Council is contributing the lion’s share with $11.37 million in ratepayers’ money going towards one of the biggest local projects in decades. 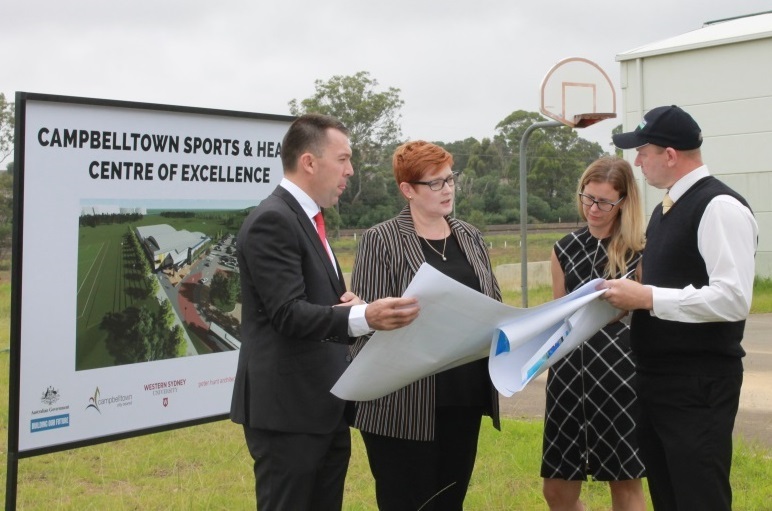 “This centre will be an asset to Campbelltown City and the broader region as an elite sports training facility, health, education and wellbeing precinct,” says Mayor of Campbelltown George Brticevic. Final design almost done: Mayor George Brticevic with Senator Marise Payne, a representative of Western Sydney University and Mark Berriman, executive manager of the healthy lifestyles section at Campbelltown City Council. Last week Cr Brticevic joined Liberal senator for Western Sydney Marise Payne and a representative of Western Sydney University for an onsite meeting to discuss how plans for the centre were progressing. “It was a valuable experience to look over the concept design plans for the centre and to be briefed on the final design process which is now taking place,” Senator Payne said. “The centre will be a hub for exceptional athletes and health experts, and I am pleased that a number of sports organisations have signalled an interest in using the facility. “With top tier sporting talent under one roof, the centre will provide training and development pathways for aspiring athletes and sports teams which is a great win for the Macarthur community. Federal infrastructure minister Michael McCormack said his government’s contribution of $7.2 million would help deliver an economic dividend for Campbelltown. “Construction of the centre is likely to support over 140 jobs, and once it is complete it is estimated that a further 50 on-going jobs will be created – a massive boost for this rapidly growing region,” Mr McCormack said.